Wonderful, private and cozy cottage up in the forest of Kaloko Mauka ( directly above Kona town!). Situated on 5 acres and 2700 foot elevation, this stand alone cottage is surrounded by beautiful ohia trees and is at least 300 feet from the main residence. The owners live further down on the property. Wild chickens and native birds abound. Kaloko is a special place with cooler weather than you will find down in town. It's nice to retreat up here after a hot day at the beach. Afternoon/evening rain does occur and it provides perfect sleeping weather. Evenings/mornings in the winter months can be cool, so we recommend light sweaters/socks if you get cold. We are located on Mount Hualalai right above Kailua Kona. This one bedroom house has a small deck on the front and a larger deck with yard in the back. Nice and secluded. Perfect for the couple wanting a romantic getaway! 10 minutes to the airport, beaches and shops. Hike the mountain trail, birdwatch or just relax on the lanai! . We have 2 rental homes on this property. : For those families that need a little more room, please inquire about our other vacation rental #186204! We will give families a discount for renting both cabins. Booking.com award winner 9.0 rating!!! Originally from Oahu, Caroline and Scott moved to the Big Island in 1994 and started their own vacation rental business in 2003. They are the parents to two children and a menagerie of dogs, cats and hens. We love the Big Island and Kaloko-Mauka is the most beautiful mountain neighborhood with lush forest. After a hot day in Kona town, nothing is as refreshing as heading up mauna for some cooler weather! Native birds, trails, and acreage gives lots of privacy and serenity. 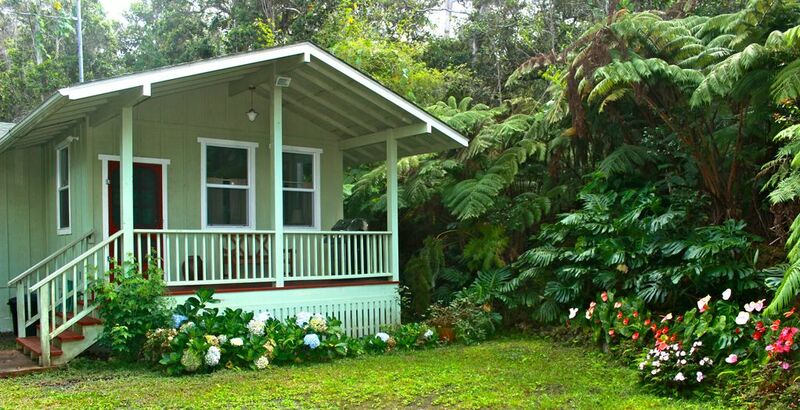 Cottage is surrounded by beautiful, native Ohia trees and Hapuu ferns. Completely private, centrally located 10 minutes above town, cool weather; perfect for sleeping! Enjoy the hot tub under the stars on your own private deck, surrounded by nothing but lush forest. The living room comes equipped with a propane wall heater for those cooler evenings. 4G internet! FAST AND UNLIMITED so you can upload, stream and get done any work you need to do while out on vacation! Cottage is located in the beautiful Kaloko Mauka subdivision; just up the road from Kona town. Lots of privacy as each lot on the street is at least 5 acres in size. Head up the street to an easy forest hike or visit the family owned Mountain Thunder Coffee farm. Very convenient to everything!